Hiring quality talent is not easy. Talented professionals today are busier, more distracted and even scarcer. What used to work earlier, doesn’t work well now especially when you’re hiring for quality talent pool. MS/PhD (PhD preferred) in engineering or quantitative fields. Minimum 7-10 yrs of experience. Must have strong Java programming skills. Must be proficient in C++. Must be the best in hadoop, spark, abnitio, informatica. Must be unparalleled in qlik sense, tableau, alteryx. Must be a gold medalist in fullstack software development. Must be NASA awarded Astrophysicist. Must at least have been awarded by the prime minister of india once. Preference will be given to candidates with a horn poking out of their forehead. 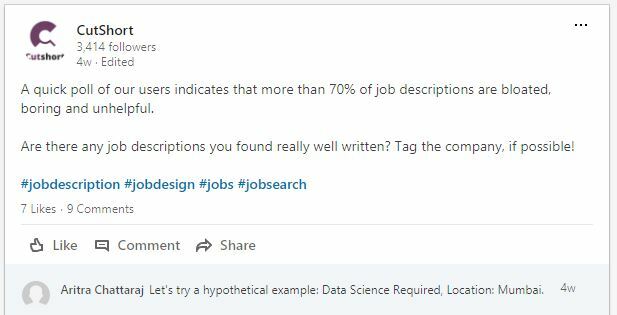 Yes, this is a hypothetical but this is what a data science job description in India looks like. Most job portals are a joke. CutShort, in contrast, does a wonderful job of collating requirements, however, HR professionals must put more effort into figuring this out and actually doing their research. In the product world, there is a concept of Minimum Viable Product. It basically means a product team needs to trim down the product to the most important feature set rather than keep adding more and more features. Similarly, your requirements in a job description need to be minimal and viable. Your objective is not to make a super-set of all requirements, it’s quite the opposite — finding the minimum number of requirements a candidate *must* meet. Nice-to-have requirements should be kept separate. The point is that in such fast-paced world, it’s important not to get fixated on just the current skills of the candidates. If you are not able to find enough good talent, do consider the alternatives. For instance, Bilal Budhani, cofounder at Kiprosh was facing the same issue. “There aren’t enough Ruby on Rails developers out there so I’m planning to hire Php devs and then train them on RoR”. It makes sense to look for strong fundamentals, capability and attitude to learn new skills fast are much more important. The problem here is that these are not good qualification criteria. There are several smart developers who may come from backgrounds you never thought of. They don’t have time to contribute to open source on GitHub – they might be simply busy building awesome stuff that works like charm. I understand that as a busy recruitment professional, you can’t spend enough time on every candidate. You need them to prove their competence before you invest more time. But if you’re sending tests or assignments before engaging with them, you might be losing good candidates. In a following post, we will look at how to refresh the way you conduct your interviews, schedule those interview, offer letter negotiations and engage with the candidate’s post-offer stage.